Unexpected rabid item in the bagging area. As we’re learning fairly quickly with VR, there are some titles that lend themselves to the format a lot more than others. Job simulators give the player the novelty of performing mundane tasks in quirky, fun environments, usually with catastrophic results; and shooting galleries let gamers try out weaponry without any risk to themselves or others. So what if you combined the two then threw in hordes of angry fruit? 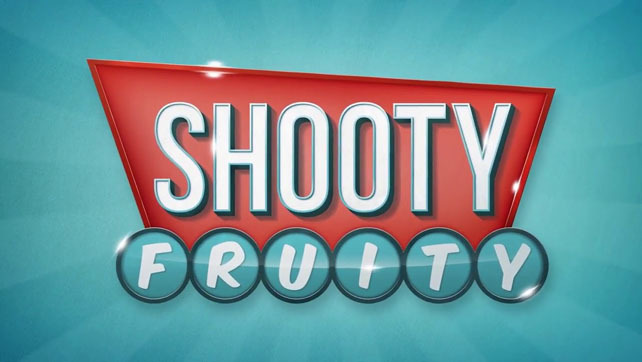 You’d have Shooty Fruity, a game about saving your supermarket from destruction when the citrus goes bad. It might sound mad, and it is, but it’s a segment of brilliance just in time for Christmas. You are an employee of Super Mega Mart that has the unfortunate curse of persistently being invaded by the fruit it’s supposed to stock. As a worker, your job is to serve the customers whilst fending off the invaders with whatever happens to be at hand. It’s a good thing then that it’s guns… lots of guns. As items travel along conveyors to your waiting hands ready for scanning and lobbing towards the bagging area, waves of attackers in the form of lemons, limes, cherries, bananas and more creep out from behind the shelves with one purpose – to kill you. 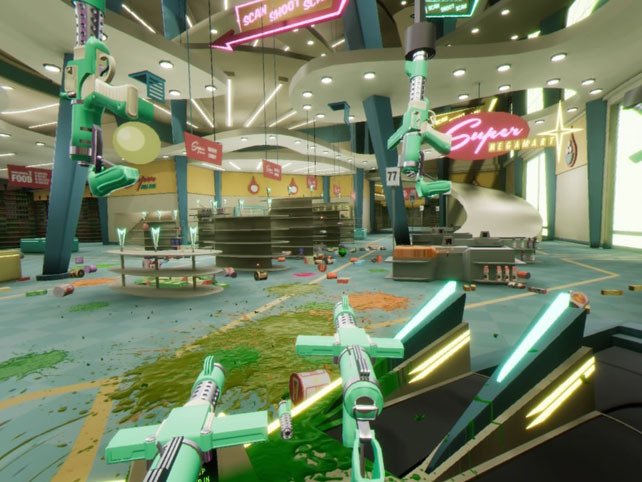 Fortunately Super Mega Mart takes health and safety seriously and has a rack of weapons within easy reach so that you can make sure that bottle of Soy Sauce gets bought whilst you splat a bunch of grapes with a shotgun. Scan enough items and survive your shift and they’ll let you take a rest in the employee lounge before needing someone to serve dinner in the canteen. It’s a humdrum routine spiced up with the ever present risk of death by blueberry. What’s not to like? The premise is ridiculous and Shooty Fruity has a very cartoon feel to it, though after a couple of minutes it’s clear there’s a serious game under the till. Before heading into the first challenge, there’s a shooting gallery to let you familiarise yourself with the controllers and initially unlocked firearms by taking down cardboard bad guys. It’s a great place to practice because dual wielding is crucial to success, whether it’s a shotgun in one hand and a pistol in the other, or a submachine gun and grenade, the idea is that you keep the swarm back whilst still maintaining the job aspects. In each scenario there’s a steady flow of items to either scan or place in the right location, and getting these correct awards more frequent guns in the overhead rack, or opens up more powerful ones to be plucked out and used. You get to choose your loadout up front so that you’re guaranteed to have only your selection available, but it will always make you work to get to the best ones. There’d be no challenge otherwise. With a mix of everything from handguns to C4 launchers, there’s enough on offer to really deal some pulpy damage, and it’s so satisfying to obliterate the menacing fruit. Targeting, firing and movement is millimetre perfect so there’s a confidence in how you play. Laser sights (which are optional) help guide your aim and remove the issue many shooting games have of needing to put the controllers between the camera and headset for aiming, and therefore disrupting the tracking. That said, after a few rounds there’s a natural rhythm you seem to fall into and you start picking off apples and oranges without the careful lining up of shots you’ll have started with. It pulls off superbly that feeling of being like John Wick when you start nailing everything at distance with single shots, or taking out two targets on opposite sides of the screen at the same time. It doesn’t matter what you look like outside the headset, inside it YOU ARE AWESOME! Shooty Fruity also gets across a tangibility that doesn’t happen as often as I’d like in a VR game. The Move controllers on the PSVR version definitely help with the heft and vibration. Even though you know it’s not real, there’s a feeling of being trapped and vulnerable in a work space which adds to the urgency when you start to get swamped. 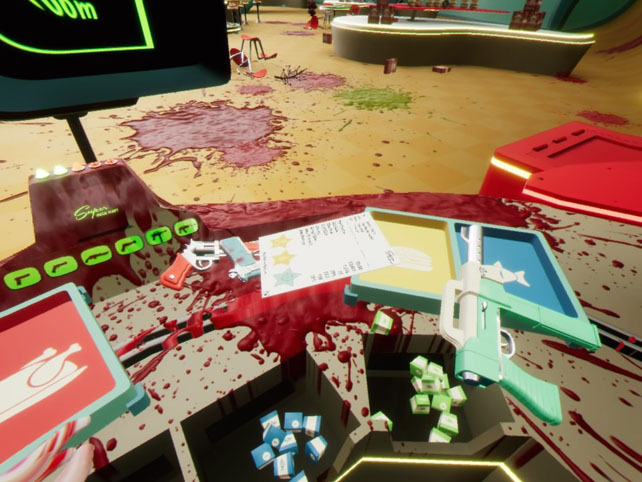 The sounds of exploding strawberries after the deafening roar of an assault rifle lend weight and substance to the world, and you’re so drawn into the pattern of scan, track, grab weapon, repeat that you don’t realise what a mess you’re making of the store. Shelves are blasted clear of stock, juice is splattered everywhere, and your hands are dripping with the innards of the mushed enemies. It’s quite a scene, and definitely not one you’d want to clean up in real life. 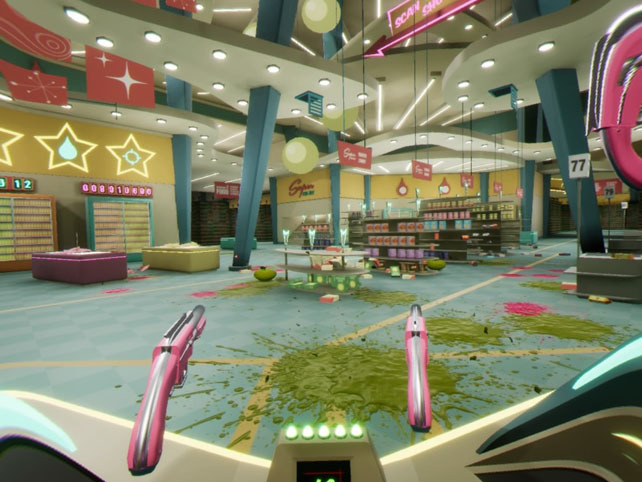 There’s more than just a VR room for blasting going on here too, the supermarket is decently fleshed out and not just with the signage and amusing Tannoy, but also with after action reports that read more like insights into a disgruntled workforce. Each level you attempt has three stars to aim for which can be awarded for different reasons depending on the challenge, and that’s how the progression system works for opening up the next scenario. Clearing a level and annihilating the fruit gives you juice as an in-game currency to decide which new guns you want to buy from the vending machine. There are also different job scenarios such as filling food trays in the canteen or packing groceries, each demanding a different level of focus and co-ordination. It’s also not a game that can be breezed through, there’s a decent difficulty spike and the range of weapons opens up experimentation with loadouts that encourages replay. 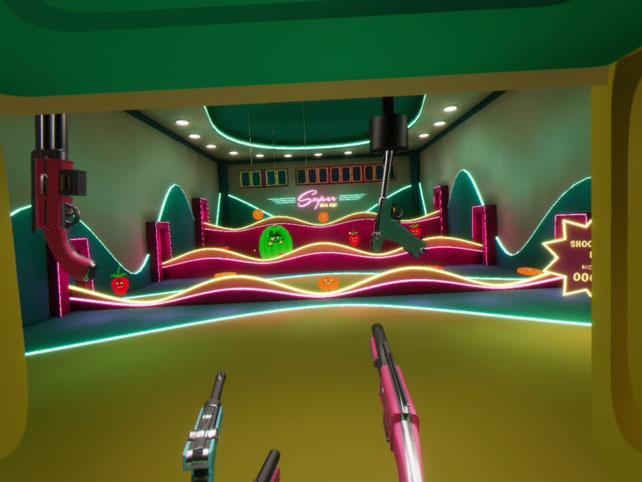 Shooty Fruity’s got a lot going on for a low priced VR title, which is a refreshing change considering some that are out there (Fruit Ninja, I’m looking at you). At its core Shooty Fruity is a job sim for checkout staff with a test of precision shooting and time management skills. 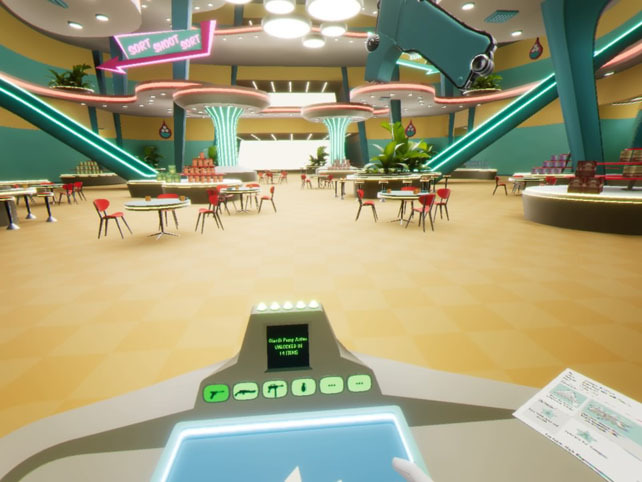 It demands a lot of hand-eye co-ordination that might end up being full on for those new to VR, however, it won’t take long to uncover its charms and get to grips with it. From the intuitive interface to the brightly coloured mess you’ll leave your workstation in, it’s a great game that compels you to keep going and be a better fruit destroyer. If you find yourself with a VR unit from Santa, make sure he’s left you enough store credit to buy this. It’s loud, frantic and brilliant… you’ll find nothing else like it. 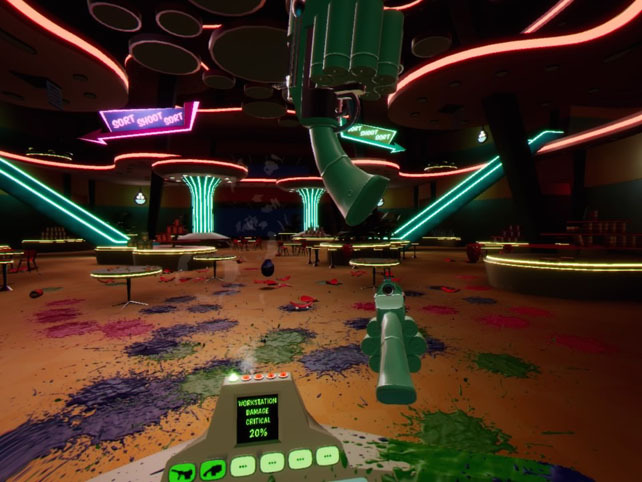 A PS4 review copy of Shooty Fruity was provided by nDreams PR team, and the game is available now on PSVR, Oculus Rift and HTC Vive for around £15.